A 600-year-old gold ring engraved with St George and the Dragon sheds new light on the saint’s medieval followers in Norwich, an expert has told the BBC. The ring, found by a metal detectorist in South Creake, Norfolk, dates from between 1350 and 1430. Dr Jonathan Good, author of The Cult of St George, said the ring “attests to the popularity of St George” and may be linked to a guild devoted to the saint. The ring was ruled to be treasure at an inquest in Norwich this week. It is set to be acquired by Norwich Castle Museum. I attended another club dig yesterday, this time in the Bedford area, on 4 fields of bean stubble. The soil was heavy clay and it had been raining heavily overnight and continued to rain almost all day. I lasted 2 hours before giving up, looking like something risen from a primaeval swamp to terrify small children. I shivered all the way home and had a stiff drink and a hot shower when I got there. The mud was Biblical. My pin pointer was covered to half a inch thick. Eventually I couldn’t find the on/off switch and the little speaker vents were covered with mud so I couldn’t actually hear it bleep. My finds pouch was filled with mud, the pin pointer holster was filled with mud, my knee pads stuck to the ground every time I knelt down, and both the spade handle and the detector stuck to my hand. It wasn’t just the mud, but all the loose bits of vegetation that stuck to the mud. If I wasn’t a primeval swamp monster I was at least a walking compost heap. So I gave up. The fields were generally quiet as regards actual signals. The odd iron grunt, the occasional good signal and an awful lot of chirps and chatter. The latter was because the coil reacted every time it struck a bean stalk. Unlike wheat or barley stubble, which the coil just pushes out of the way, bean stubble is much thicker and stronger which added to the problems of the mud. In two hours I dug 4 pieces of God-knows-what. It was impossible to work out in the field what they were because of – did I mention the mud? The more I tried to rub it off on the spot the more I seemed to rub on. Eventually I put the nondescript pieces of metal in my finds pouch, hoping they would not stick to the trowel and be lost again. It took me several hours this morning to clean the mud off most of my equipment and to have a look at my finds. Three pieces of scrap lead and 1 copper alloy book clasp or strap end which will be going to see the FLO in December. Those who stuck it out were rewarded for their persistence. Other finds included a dozen or more hammered coins, a Bronze Age gold ring and a medieval bronze figure of Christ some 4″ to 5″ tall, presumably from a large crucifix. There are going to be some very happy FLOs I suspect. Finds: 1 strap end (probably). A metal detecting enthusiast has dug up the find of a lifetime by unearthing a 13th century gold ring worth thousands of pounds. 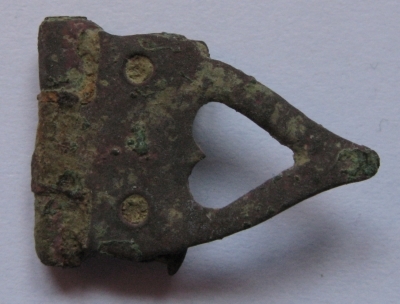 John Cooper, formerly of Sleaford but now living in Cheshire, has been following his hobby of metal detecting in the Sleaford area for the last 30 years, in the past finding such things as Roman coins and brooches.